April is shoulder season in much of the diving world, boasting fabulous conditions and exciting marine life. Here at The Adventure Junkies, we want to help you find the best liveaboard destinations to go in April. In this article, we’ve laid out 10 perfect scuba destinations for this time of year. Southeast Asia and the Caribbean enjoy dry weather and tons of sharks in April. The end of the summer and rainy season in the South Pacific brings plankton blooms which attract manta rays and whale sharks. It’s a peaceful time to dive the Seychelles, where conditions are calm and visibility is endless. 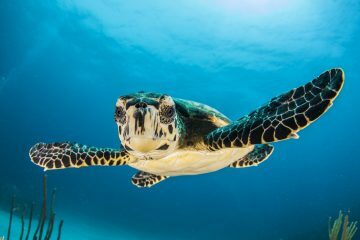 Oman is starting to get hot, but lucky divers will have the chance to see nesting hawksbill turtles. Happy diving! The underwater geography at Belize is one of a kind. 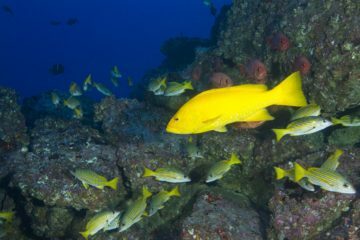 Steep walls and one of the world’s most expansive barrier reef systems are home to a colorful jumble of reef fish and macro life. Nearby, the infamous blue hole awaits divers brave enough to venture near it. Not to be forgotten, pelagics such as sharks, barracudas and dolphins play in the open water. With a Belize liveaboard, you can see it all. March falls during the dry and cool season in Belize, when divers will enjoy amazing visibility up to 130ft (40m). Visibility can sometimes be affected by the plankton blooms, but this tends to happen more into the summer. April falls during the cool season and is the beginning of the whale shark season in Belize. Since this is such a popular time to dive, it’s wise to check for deals as early as possible to avoid paying top dollar. A cluster of over 100 islands in the middle of the South Pacific, French Polynesia is an advanced diver’s mecca. You can dive everything from protected lagoons to colorful coral reefs to wrecks, but the real draw is drift diving with manta rays, schooling sharks and barracudas. A French Polynesia liveaboard will open up your world to endless diving possibilities! April is summertime in French Polynesia and comes on the tail end of the rainy season. 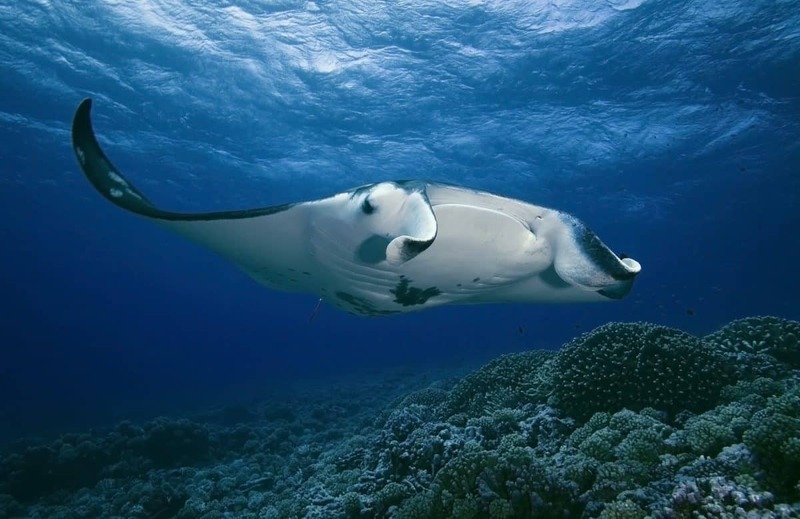 The plankton-rich waters attract big fish such as manta rays. Meanwhile, the calm surface conditions make it the ideal month for diving. The Bahamas are iconic for their scuba diving sites, and it’s no wonder. This Caribbean archipelago comprises 700 islands which boast wrecks, reefs and caves teeming with marine life. Many of the wrecks are shallow and there is good diving here for every level. Since many of the islands are uninhabited, the way to make the most of your trip is with a Bahamas liveaboard. This is shark season in the Bahamas and you can expect to see oceanic whitetip sharks starting in April. This hot month sees little rain and falls outside hurricane season, meaning it’s high season and a very popular time to visit. Once again, it’s best to book early if you can. Less popular than the Bahamas are the equally stellar Turks and Caicos Islands, situated just to the south. Impressive barrier reefs give way to steep coral walls swimming with eagle rays and hammerhead sharks. Since the dive sites are located at some distance from each other, the best way to dive the region is with a Turks and Caicos liveaboard. The dry season from November to May is the best time to dive the Turks and Caicos Islands as there is a lower risk of hurricanes. Water temperatures and visibility depend on which island you’re diving, but temperatures generally hover between 73-79° F (23-26° C) in April. April is low season, so keep an eye out for deals. Komodo is found in the midst of the Coral Triangle, the most biodiverse marine region in the world. Here you’ll find dugongs, turtles, dolphins and plenty of reef fish. Sharks and manta rays are also common sightings. The most logical choice for exploring this vast area is with a Komodo liveaboard. April is the best month to visit Komodo Island. Just after the rainy season, Komodo enjoys cool, dry weather and calm waters starting in April. You’ll also see the most pelagics in April. Consequently, this is the first month of the period when the most liveaboards are operating in the region, making it the perfect month to visit. 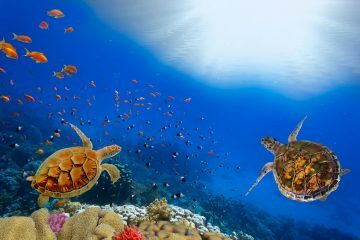 The Philippines are also located in the Coral Triangle and these islands are home to over 1000 species of fish, macro life and pelagics. The country is especially known for its macro life but sites, such as Tubbataha Reef, also have excellent shark diving. Night diving and wreck diving offer some variety for more advanced divers. Many sites are only accessible with a Philippines liveaboard. April wraps up the diving season in the Philippines, since May signals the start of typhoon season. April generally offers calm, dry conditions, and is a good time to glimpse whale sharks. Tubbataha Reef opens between March and June and is closed the rest of the year. Visibility in the Philippines depends on the location and can be anywhere from 15 to 100ft (5 to 30m). Advanced divers can swim with sharks, sea turtles and manta rays at the outer reefs, which are packed with caverns and impressive drop-offs. Meanwhile, beginners can coast around the inner reefs and drink in the sights which include massive sea fans and eerie shipwrecks. From the amazing Aldabra atoll to the islands’ characteristic black granite, a Seychelles liveaboard offers something for everybody. The shoulder season is the best time to dive the Seychelles, when surface conditions are calm and visibility is fantastic. April can get quite humid; water is at its warmest although the air temperature doesn’t change much from month to month. Before you go, check the forecast for the island you plan to visit, as wind and currents can vary depending on location. Located on the tip of the Arabian Peninsula, Oman boasts two protected marine areas with healthy marine life and uncrowded dive sites. Not yet a major destination, Oman is perfect for beginner divers looking for a relaxing way to get acquainted with the sport. Of course, an Oman liveaboard will more than live up to anyone’s expectations, with chances to see macro life and schooling fish. Diving season in Oman is generally seen as ending in February and by April, air temperatures are starting to verge on the uncomfortably warm. The water is a pleasant temperature but can get chilly thanks to thermoclines. If you’re a fan of nesting hawksbill sea turtles, you’ll see them arrive in Oman from March all the way through June. April is also the last month to dive the Daymaniyat Islands before their annual closure during the hot season from May to October. Whether you’re after pelagics or exquisite macro life, you’re sure to encounter it in Fiji. Over 300 volcanic islands in the South Pacific harbor the world’s best soft corals as well as a hodgepodge of wacky marine species. A Fiji liveaboard can bring you to undiscovered dive sites. You’ll soon find out why this country places near the top on many diving lists! Fiji’s optimal dive season runs until April. The end of the summer brings rain and calm, warm water between 82 to 86°F (28 to 30°C). Visibility is not great but this is a small sacrifice to pay for plankton blooms which draw whale sharks and manta rays. Ironically, you’ll also find the best deals during this time, since this is low season elsewhere in Fiji. The Mergui Archipelago in Burma only started allowing divers to visit in 1997, so these 800 islands are still ripe for exploration. This is also a marine protected area, with plenty of rare macro life and no shortage of bigger fish. Towering drop-offs complete the picture, providing the perfect environment for sharks and other pelagics. Don’t miss your chance to book a Burma liveaboard while this place is still undiscovered! The only time to dive with a Burma liveaboard is between October and May, and the best time to dive the Mergui Archipelago is between December and April. Water is generally calm, the weather dry and the visibility decent during this time. During plankton swells, divers will have the chance to spot manta rays and whale sharks in exchange for poor visibility. HIGHLIGHTS: Chance to dive in places no one has ever dived before!